Tickets to the World of Coca-Cola provide entrance into Atlanta’s homage to this most famous soft drink. The World of Coca-Cola showcases the history of Coca-Cola throughout it’s more than 125 years of history. Learn about the legend of the secret formula for Coca Cola and see the vault where the formula is secured in the Vault of the Secret Formula. Get an inside look at the bottling process in Bottle Works and see the world’s largest collection of Coca-Cola memorabilia in the Milestones of Refreshment gallery. Don’t forget to give the 7-foot-tall Coca-Cola Polar Bear a big hug! Continue your visit by experiencing the thrilling "In Search of the Secret Formula" 4-D theater experience (3-D movie with moving seats). Then move to the Pop Culture Gallery where you can view works by artists such as Steve Penley, Haddon Sunblom and Howard Finster. Enjoy the most popular area in the World of Coca-Cola by tasting over 100 flavors from around the globe in the Taste It! beverage lounge. Cap off your visit at the Freestyle machine, a sleek fountain with more than 100 drink choices or create your very own. Each guest also takes home a FREE commemorative8-ounce bottle of Coca-Cola. 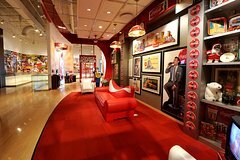 And don't forget to take the excitement home with clothing, collectibles and gifts from The Coca-Cola Store.